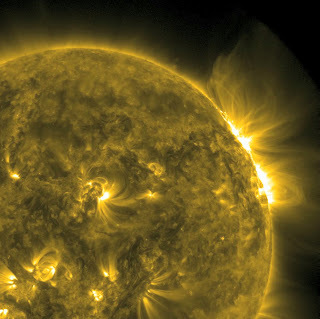 The sun unleashed an X1.8 class flare that began at 13:12 ET (18:12 GMT) on January 27, 2012 and peaked at 13:37 ET (18:37 GMT). The flare immediately caused a strong radio blackout at low-latitudes, which was rated an R3 on NOAA's scale from R1-5. The blackout soon subsided to a minor R1 storm. Models from NASA's Goddard Space Weather Center predict that the CME is traveling at over 1500 miles per second. It does not initially appear to be Earth-directed, but Earth may get a glancing blow. C-Class - Small solar flares which hardly affects the Earth. This recent solar flare is an X1.8 Class flare. Each class has a peak flux ten times greater than the preceding one. Within a class there is a linear scale from 1 to 9 (multiplicative factor), so an X2 flare (2 x 10−4 W/m2) is twice as powerful as an X1 flare. Initial movies from NASA's Solar Dynamics Observatory (SDO) look as though there was an eruption and coronal mass ejection (CME) associated with the event, and NOAA’s GOES satellite also detected a solar energetic particle (SEP) event a half hour after the flare peak. 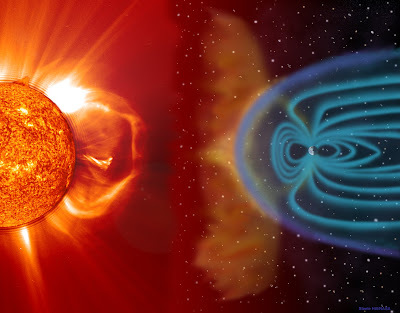 How these CMEs and SEPs form and evolve, as well as their association with the flare event itself will be studied in the coming hours and days as more data and movies from NASA's SDO, STEREO and SOHO instruments become available. When the sun releases magnetic energy into space, known as coronal mass ejections, the particles released come crashing into the Earth's magnetic field. 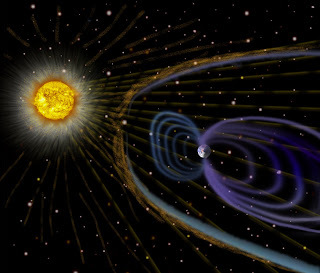 One observation shows that during this time, energetic electrons in Earth's outer radiation belt vanish before coming back a few hours later in full force. This phenomenon has been a mystery to physicists since the 1960s and astronomers in UCLA may have found the answer to it. In related news, UCLA researchers have explained the puzzling disappearing act of energetic electrons in Earth's outer radiation belt, using data collected from a fleet of orbiting spacecraft.